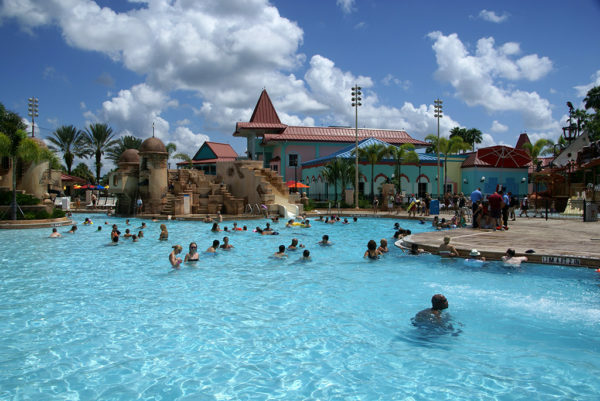 When looking for a resort to spend your Walt Disney World vacation at, why not chose the Caribbean Beach Resort! This is a wonderful resort in the moderate price category. If you are looking for a fun resort with a tropical feel, for a decent price, this is the resort for you! This is a very large resort, which can be wonderful if you want peace and quiet. The resort has six “villages” or clusters of buildings, a seperate check-in (the customs house), and Old Port Royale(which houses the food court, sit-down restaurant and theme pool). The villages are: Jamaica, Aruba, Barbados, Martinique, Trinidad North, and Trinidad South. The villages curve around a lake with Jamaica, Aruba, and Barbados accessing Old Port Royale by bridge and an island. Each village has it’s own quiet pool, with most being open 24 hours, so you can always take a quick dip or just go for a swim without having to deal with the crowds that often accompany the theme pool. The grounds are very nicely manicured with tropical plants and beautiful sidewalks lit by street lamps. Each village also has it’s own beach with hammocks. Though the lake is off limits for swimming, the beaches provide play time in the sand and a way to get off your feet at the end of the day by relaxing and watching the water from a hammock. OPR houses the Market Street food court, Shutters at Old Port Royale(a sit-down Caribbean style restaurant), and the Calypso Trading Post and Straw Market. Directly behind this area is the main theme pool. The pool comes complete with kids pool, slide and a hot tub. There are plenty of lounge chairs and a poolside bar. Also available near the pool is hair braiding. Each village has its own Busstop plus one for Old Port Royale.The villages feature a grouping of buildings all painted bright Caribbean colors and with wonderful details and hidden courtyards with bright umbrellas. The rooms are the most spacious offering of all the moderate resorts at WDW and are also decorated in bright, fun, vibrant colors. All offer either 2 double beds or 1 king size bed. The rooms also have a table with 2 chairs, an armoire(housing the tv and other storage), a coat rack and luggage bench with storage inside, and a free refgrigerator. The bathrooms feature a privacy curtain in front of the vanity area, a coffee maker, safe and a separate room with the toilet and shower. The rooms are quite comfy and all come with a ceiling fan and air conditioning. I find this resort to be the perfect place to kick up my feet and lay my head during my WDW vacation. I hope that you have found this helpful.